Paris – February 22, 2017 .Sébastien Bazin, Chairman and Chief Executive Officer of AccorHotels, said: AccorHotels has posted an excellent performance for 2016 in a challenging environment, in particular with record levels of EBIT and numbers of hotel rooms opened. Thanks to the efforts made by our teams around the world, we have implemented strong operational levers, which enabled growth in earnings to outpace that in revenue. We have ventured out to conquer new markets and offer new services thereby consolidating our leadership position and opening up new horizons for our clients. Carrying out our project to turn HotelInvest into a subsidiary in 2017 will give us significant headroom to seize the numerous opportunities provided by the rapid transformation of our industry." On July 12, 2016, AccorHotels announced its intention to dispose of its real estate operations, united within HotelInvest, at the end of first-half 2017. In accordance with IFRS 5, assets held for sale have been placed in a separate item on the balance sheet, in the income statement and in cash-flow statement. However, to facilitate comparison with the previous year and the objectives announced by the Group, all comments in this press release regarding business trends and profitability are formulated on the basis of consolidated figures before separation of these operations in the income statement. The tables in the appendix show the reconciliation between the consolidated financial statements and the figures provided before application of IFRS 5. Growth in the Asia-Pacific region was led by the development over the past three years of 252 hotels operated under franchise agreements or management contracts and by RevPAR growth of 4.9% in 2016. Despite a challenging business environment in Brazil (-2.4%), the Americas reported an improved performance, driven notably by RevPAR growth of 17.6% in Mexico. Eastern Europe, the United Kingdom and Germany were the main business drivers in Northern, Central and Eastern Europe, posting revenue growth of 7.6%, 4.3% and 3.7% respectively for the year. Revenue was down 2.8% in France in 2016. Business was very challenging in Paris (RevPAR: -13.2%), where demand was affected by recent events, while hotels outside the capital put in a solid performance for the year (RevPAR: +4.2%). Development, which added €418 million to revenue and 7.5% to growth, with 81,042 additional rooms (347 hotels), of which 89% under management contracts or franchise agreements. At December 31, 2016, the HotelServices portfolio comprised 4,144 hotels and 583,161 rooms, of which 31% under franchise agreements and 69% under management contracts, including the HotelInvest portfolio. Disposals, which reduced revenue by €355 million and growth by 6.4%. Currency effects, which had a negative impact of €136 million (-2.4%), resulting mainly from declines in the British pound (€72 million), the Argentine peso (€16 million), the Brazilian real (€12 million) and the Egyptian pound (€8 million). Consolidated EBITDA amounted to €1,037 million in 2016, representing year-on-year increases of 4.0% like-for-like and 5.2% as reported. Up slightly at constant exchange rates, EBITDA margin increased 0.7 points to 18.4%. (0.2 points on a like-for-like basis), thanks to tight control of operating costs. 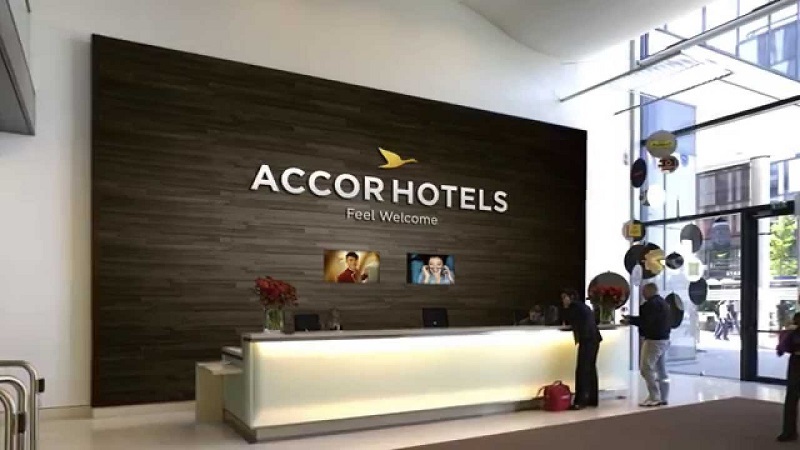 AccorHotels recorded healthy EBIT growth in most of its markets, with a growing contribution from the MMEA and Asia-Pacific regions, and less reliance on France. The Asia-Pacific region performed particularly well, with a like-for-like increase of 32%, reflecting strong demand in Southeast Asia and very active development over the past three years. The MMEA region delivered like-for-like growth of 13%, driven by the continuation of a strong recovery in the Iberian Peninsula (+201%). The NCEE region, which represents 55% of 2016 Group EBIT, posted an increase of 9% thanks to solid business levels in key markets Germany and the United Kingdom. The decline in EBIT continued in France (-13%), notably following events in Paris and Nice. Performances in the Americas were dampened by Brazil, which is still plagued by major economic difficulties despite the beneficial impact of the Olympic Games. HotelServices' business volume was up 20% on a like-for-like basis following the acquisition of the FRHI Group, which generated gross volume of €1.9 billion in the second half of the year. HotelServices’ EBITDA rose to €450 million. 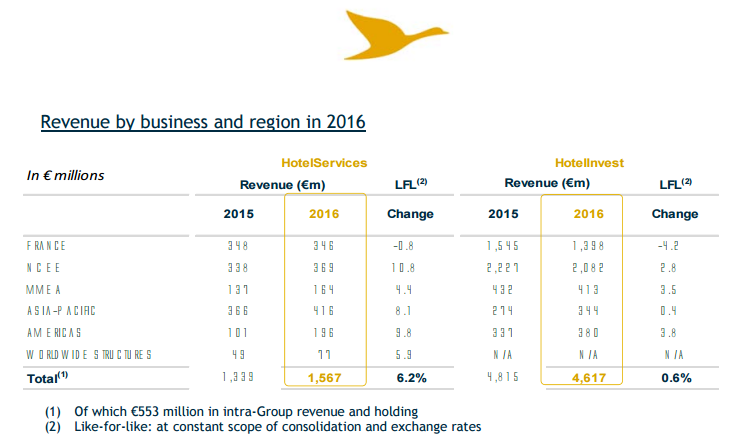 HotelServices recorded EBIT of €393 million, an increase of 4.6% like-for-like. The EBIT margin narrowed by 1.8 points to 25.0%. HotelInvest’s EBITDAR improved by 0.3% like-for-like to €1,376 million. Despite a complex business environment, HotelInvest posted record EBIT of €385 million, a sharp 3.9% increase like-for-like. This result means that the EBIT margin has doubled in the space of three years, from 4.1% in 2013 to 8.3% in 2016 (up 0.5 points compared with 2015). The increase is attributable to sustained hotel business, notably in the United Kingdom and Germany, and to HotelInvest's transformation. In 2016, 148 hotels were restructured, of which 96 leased hotels and 52 owned hotels. The Group sold 85 hotels to Eurazeo in Europe as part of the creation of Grape Hospitality, and secured the restructuring of a portfolio of 31 hotels (4,097 rooms) in Australia with a subsidiary of the Abu Dhabi Investment Authority (ADIA). These transactions had the effect of reducing adjusted net debt by €320 million. HotelInvest’s gross asset value was €7.6 billion at December 31, 2016, versus €6.9 billion at December 31, 2015, driven by acquisitions and development in the amount of €0.6 billion. 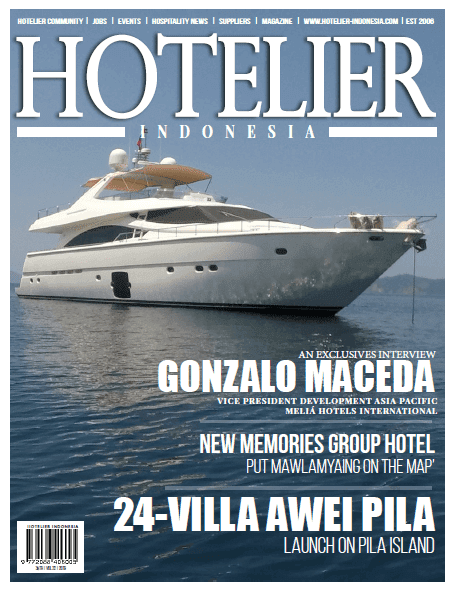 HotelInvest’s gross asset value has increased by nearly 70% since the end of 2013. On January 16, 2017, the Group announced that the gross asset value of the Booster portfolio was €6.6 billion at December 31, 2016. In the year ended December 31, 2016, funds from operations amounted to €868 million, versus €816 million in 2015. Recurring development expenditure amounted to €245 million in 2016, while renovation and maintenance expenditure came to €297 million, versus €269 million in 2015. The Group’s recurring cash flow amounted to €326 million, versus €341 million in 2015, due to strong business levels (+€48 million) and an €87 million increase in development expenditures. Consolidated net debt totaled €1,488 million at December 31, 2016, an increase of €1,682 million year-on-year, resulting mainly from the acquisitions of FRHI, onefinestay and John Paul. At December 31, 2016, the cost of the Group’s debt was at a record low of 2.85%, versus 2.89% at December 31, 2015. 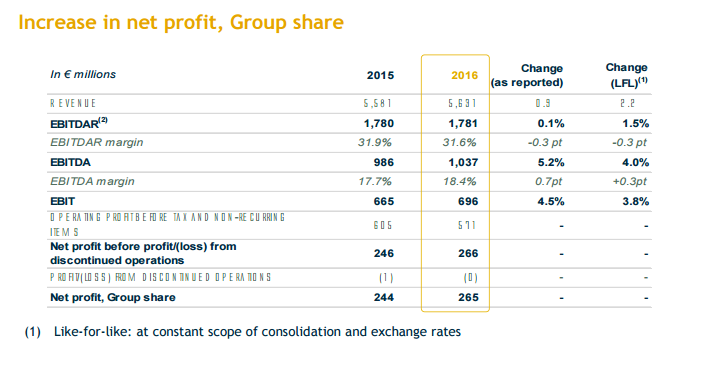 In January 2017, AccorHotels issued a €600 million 7-year bond with a coupon of 1.25%, thereby further lowering the cost of the Group’s debt to 2.57%. AccorHotels also has an unused €1.8 billion confirmed long-term line of credit. Operating profit before non-recurring items, net of tax amounted to €469 million, representing earnings per share of €1.81. Based on these earnings, AccorHotels will submit for the approval of shareholders the payment of a dividend of €1.05 per share at the May 5, 2017 Annual Shareholders' Meeting, with payment 100% in cash or 100% in shares at a discount of 5%. ambitious renovation program over the coming months. On July 12, 2016, AccorHotels finalized the acquisition of the Fairmont Raffles Hotels International Group. This acquisition positions AccorHotels as a leading player in the global luxury hotel market, giving it 156 facilities of the highest quality, 39 of which are under development, and providing the Group with solid expertise in luxury hotel management and marketing, and a substantial footprint in the North American market. A global luxury/upscale division has been created within AccorHotels, and Chris Cahill — a specialist in luxury hospitality who spent part of his career heading up Operations at FRHI — has been appointed to its helm. The deal resulted in an investment by the Qatar Investment Authority and Kingdom Holding Company of Saudi Arabia funds, and the allocation of seats on the AccorHotels Board of Directors to three of their representatives, as well as three independent directors. On July 12, 2016, AccorHotels announced plans to turn HotelInvest into a subsidiary, with the aim of strengthening its financial resources in order to accelerate its growth, while also providing a legal structure that will ultimately enable third-party investors to hold the majority of HotelInvest’s capital. AccorHotels will use the additional financial leeway to develop its two business lines and seize new growth opportunities, thereby maximizing the Group’s overall value. On September 27, 2016, AccorHotels launched its new JO&JOE brand with the aim of revolutionizing the traditional codes of hospitality by blending the best aspects of private renting, youth hostels and hotels. Its objective is to offer its guests a completely revisited and disruptive experience in terms of design, food & beverage, service and customer experience. A total of 50 venues in destinations popular with Millennials are to open mid-term. On November 7, 2016, AccorHotels and 25hours Hotels sealed a strategic partnership to create the conditions for global development for the brand. AccorHotels is to acquire 30% of 25hours and will be able to exercise a call option on up to 100% of the Company’s stock over the next few years. around the world. John Paul’s global network of more than 50,000 partners and its powerful CRM software will allow AccorHotels to provide an even broader choice of services to treat all travelers to the best experience before, during and after their stays. On December 7, 2016, AccorHotels and Banyan Tree Holdings announced the signing of an agreement for a long-term partnership. AccorHotels will invest an initial sum of SDG 24 million (around €16 million) in Singapore-based Banyan Tree. The two parties undertake to co-develop and manage Banyan Tree hotels around the world. Banyan Tree will also have access to the AccorHotels booking and sales platform and its loyalty program, Le Club AccorHotels. On December 21, 2016, AccorHotels announced the signing of an agreement with a wholly owned subsidiary of the Abu Dhabi Investment Authority (ADIA) to restructure a portfolio of 31 hotels (4,097 rooms) in Australia. AccorHotels (HotelInvest) will acquire the real estate of the remaining 15 ibis and ibis Budget branded properties for around AUD$200 million (€137 million). On January 18, 2017, Accor successfully placed €600 million in seven-year bonds with a coupon of 1.25%. This allowed AccorHotels to take advantage of favorable conditions in the credit market to optimize its financing costs and extend the average maturity of its debt. onefinestay and Squarebreak will provide AccorHotels with a unique, carefully selected addresses in the luxury private rental market, in both vacation and urban settings. available from the www.accorhotels-group.com website.